Emergency personnel arrive Sunday night in response to reports of a student’s fall from a window at Lambda Chi Alpha. The student was not affiliated with MIT. Parties and large gatherings are once again effectively banned at MIT fraternities, campus officials announced Wednesday afternoon, just days after a woman fell from a window at Lambda Chi Alpha. The student, who survived, was reportedly intoxicated, according to MIT Police logs, which listed the incident as alcohol-related. 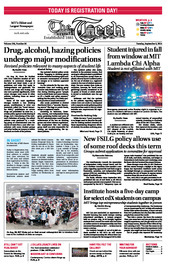 MIT prohibits alcohol at fraternity events during rush, which began last Saturday. The MIT chapter of LCA is now under suspension by both its international organization and MIT. On Aug. 26, Dean for Student Life Chris Colombo emailed all MIT students to announce changes to the Mind and Hand Book, a set of guidelines and rules that apply to undergraduates and graduates. The alcohol and drugs and hazing policies were updated significantly, while minor changes were made to other policies, including those on sexual misconduct. A student not affiliated with MIT fell from a window at the MIT chapter of the Lambda Chi Alpha fraternity at about 11:30 p.m. on Sunday and sustained injuries of unspecified severity according to Kimberly Allen of the MIT News Office. The Interfraternity Council, the Association of Independent Living Groups Board, and the AILG Facilities Committee have instated a new policy regarding approval for roof deck usage at fraternities, sororities, and independent living groups (FSILGs), overriding the existing prohibition of roof deck use. MIT has just concluded an experiment in blended learning that could reshape existing educational paradigms. A unique program held on campus Aug. 18-22 brought together students from around the world who had taken an online course in entrepreneurship and then immersed themselves at MIT — to learn how to create a startup.